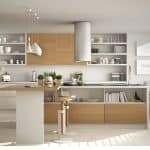 Home » Interior » Kitchen Ideas Tips: What Belongs In A Modern Kitchen? The modern kitchen usually consists of straight edges and a clear line. 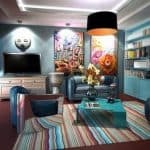 Further modern effects can be achieved by using different materials, different lighting systems and last but not least decoration. The kitchen is one of the most important places in the house and in the apartment and one that is most often used. 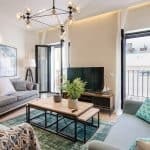 Therefore, the furniture and appliances should have a good quality, because while a bookshelf can be quickly replaced, that is something else with a complete kitchenette. We show what a modern kitchen can look like, which materials are suitable and how the lighting is optimally attuned. A kitchenette? One with l-shape? In addition a cooking island? A seat integrated into the work surface? The variants that are offered are as numerous as they are flexible. 0.2 What Makes A Modern Kitchen? 0.6 The Floor – All Tile Or What? 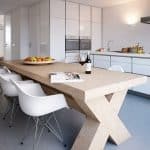 Before you even go to the detailed planning, you should be aware of what shape you would like to put in a modern kitchen. First and foremost, of course, it depends on the room. A narrow space will only accommodate one or two kitchenettes. Larger rooms have more room. Since the modern kitchen can go as an L-shape around the corner or even into the room. Even more options are offered by an open kitchen. A kitchenette? One with L-shape? In addition a cooking island? A seat integrated into the work surface? The variants that are offered are as numerous as they are flexible. What Makes A Modern Kitchen? The next step is more into the details. What should the kitchen look like? 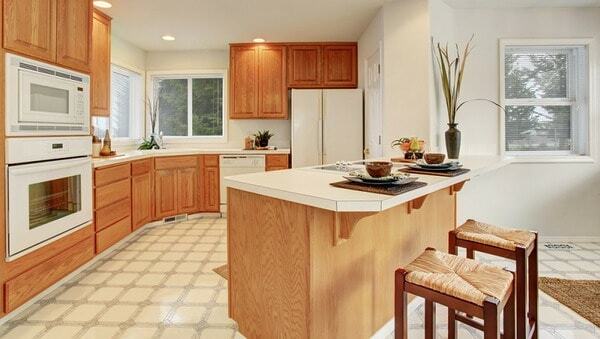 Of course, the kitchen may not be stale in modern furnished houses and apartments. The good old country house kitchen with its flourishes, its round shapes and its classic layout does not quite fit, although there may be interesting combinations. 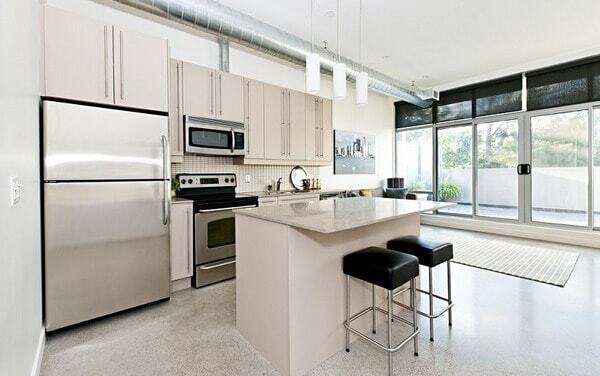 A modern kitchen is characterized by a clear line with straight edges and shapes. 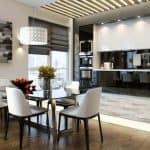 The built-in appliances, the materials of the fronts and worktops, the floor, the lighting and last but not least the furnishings and decoration make a kitchen a modern kitchen. Modern kitchens can consist of a variety of materials. While for a long time there were only wooden kitchens, today there are also veneered kitchen units in almost every imaginable color. Whether bright red shiny fronts or a dull black face. Modern kitchens can consist of a variety of materials. While for a long time there were only wooden kitchens, today there are also veneered kitchen units in almost every imaginable color. Whether bright red shiny fronts or a dull black face. Whatever is conceivable is also feasible. Just be sure to be yourself and do not exaggerate with the color, so as not to have seen enough after two years. But not only that. Also stainless steel kitchens, which, despite the material, do not immediately emit the flair of a canteen kitchen in the canteen or university canteen, you can see more and more. 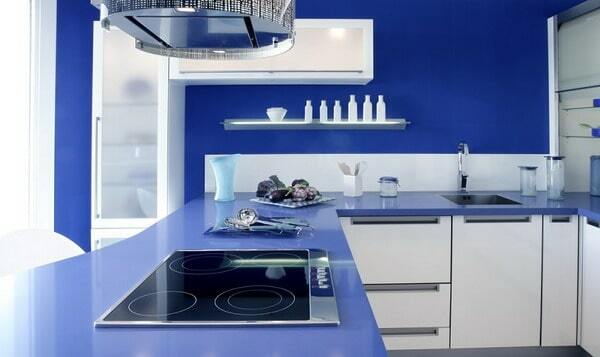 In fact, there are more and more modern kitchens with surfaces in metal look. For example, the metal X2 gives fronts a fancy look. Its surfaces are roughened and create a very special atmosphere. If that is still boring for you, you can combine the different materials with each other. Wood and metal? White glossy front and dark sides? Nothing is impossible. The materials for the worktop are no less diverse. Everything is possible, from the veneered chipboard to the real wood worktop, to a metal surface, to a continuous stone surface. While natural wood looks bring a warm mood to modern kitchens and are simply never out, dark stone and shiny stainless steel immerse the kitchen in a progressive atmosphere that screams for progress and modernity. The materials for the worktop are no less diverse. Everything is possible, from the veneered chipboard to the real wood worktop, to a metal surface, to a continuous stone surface. Even in the most modern kitchen, it is hardly possible without tiled mirror, not to ruin the wall behind the worktop and stove. When cooking inevitably creates dirt. It sizzles. It injects. There is something wrong. Where wood is chopped, splinters must fall. The classic white tile mirror does not have to be taken care of and can be reinterpreted with modern tiles. But it can also look different: laminate and parquet are no longer found on the kitchen floor, but also on the wall. Or how about blackboard color that can be described with chalk? So the wall can be used there immediately as a calendar, meal plan, recipe overview or similar. The Floor – All Tile Or What? As with the tiled mirror you will find in modern kitchens today no longer necessarily tiles or a PVC floor with a vile pattern. Dark tiles with bright joints go well with bright kitchen furniture and create a great contrast. What used to be almost unthinkable today can be found in more and more modern kitchens:parquet or laminate. Especially in open kitchens, which go directly into the living room, this creates a much friendlier and more homelike atmosphere. An abrupt transition between different soil materials is thus avoided and both spaces merge into each other. However, in the kitchen only suitable laminate should be used, which is resistant to moisture, to avoid swelling of the soil, because dripping water can never be avoided in a kitchen. As an alternative, there are also vinyl floors, which are conceivable in all optical variants, even wood and stone looks are available. 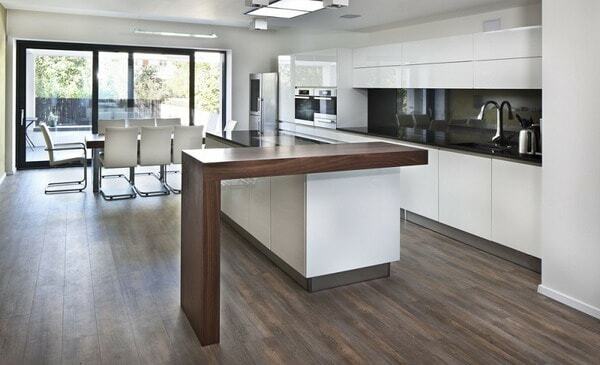 Like PVC floors, they are particularly robust, easy to clean and also cheaper to buy than laminate, parquet or tiles. What use is a modern kitchen if the appliances are from the day before yesterday? Sure, all electrical appliances do not have to be replaced when a new version is released that uses two watts less power, but that’s not all energy efficiency should be. Above all, induction hobs and gas stoves are particularly energy efficient. While the still widespread electric stoves, whether with ceramic or ceramic fields, take a perceived eternity to heat up to cooking temperature, this is done with gas or by induction from now on the same. This saves energy and costs less, even if the equipment is often more expensive to buy. Also, old refrigerators and dishwashers should be replaced with more energy-efficient, more modern appliances with efficiency class A +++, to avoid unnecessary power guzzlers. Without the right light, nothing works in the modern kitchen. However, it is to distinguish between several forms of illumination, because not everything really makes sense. A single light source, which floods the whole room, helps in the least of cases, because at the latest when snipping the ingredients you then only have shadows on the work surface and the knife digs your finger. The room light does not have to be so bright. A few warm spotlights in the middle of the room or directly above the dining table are enough. Directly above the work surface, LED spots or LED strips provide light where it is really needed. Indirect light sources provide the special accents. Whether it’s a light bar under the worktop, floor spotlights on the wall, or LEDs mounted under a second hanging ceiling. The possibilities are immense and each one creates a different atmosphere. 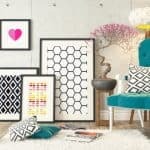 Vases and pots that pick up the crisp edges and straight lines of the kitchen and provide space for colorful flowers or kitchen herbs that can be used directly in cooking. Even with decoration and other furnishings, a special ambience can be created in the modern kitchen. Why not replace the round plates with the colorful figurines, which one carries around since student days, with modern angular ones? And is Grandma’s tea service with its golden edge really up to date? Other shapes, different colors and not least other materials create variety. This continues with the decoration. Own photos or prints of famous works of art for the walls. Vases and pots that pick up the crisp edges and straight lines of the kitchen and provide space for colorful flowers or kitchen herbs that can be used directly in cooking. A modern kitchen is characterized not only by an often clear and linear lines. 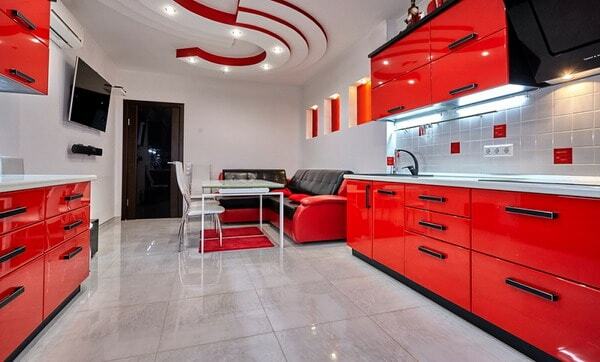 The use of materials can also create a futuristic kitchen picture. The icing on the cake is provided by the ingenious lighting and furnishings that resume the basic forms of the kitchen.